Ubisoft has revealed that there will not be a new Assassin’s Creed game in 2019, delivering on its previous promise that the franchise was not returning to a yearly schedule. 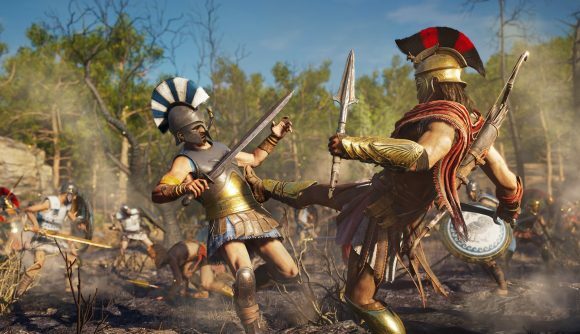 Instead, 2019 will feature ongoing support for Assassin’s Creed Odyssey, providing additional content that will keep players returning to Ancient Greece over the course of the year. Assassin’s Creed Odyssey has been developed in parallel with Origins, which has allowed for release dates within 12 months of each other. But 2019 won’t feature the release of a “full-fledged” Assassin’s Creed game. This could be taken to mean that a smaller, spin-off Assassin’s Creed game could be in the works, but Guillemot explained to GameSpot that this is not the case. We spoke with Odyssey’s creative director Scott Phillips about the idea of the game becoming a service-style title, to which he emphasised that Assassin’s Creed Odyssey is a single-player game, not a hobby game, but will still be supported with plenty of post-launch content. It looks like we could be getting more than we bargained for, though, if Ubisoft intends for Odyssey to last until the next Assassin’s Creed game, presumably in 2020. Perhaps, with it’s new RPG approach, Ubisoft will produce a Witcher 3-style expansion next year? We can only hope.